CELCOM Home Wireless - a broadband service powered by Celcom’s 4G network – offers data inclusions of more than 1 Terabyte of internet. Available at selected areas, Celcom Home Wireless is designed for residential homes with the convenience of a ‘plug-and-play’ modem. It does not require any wall-hacking or a long wait for fibre availability within your homes to access high-speed internet. Starting April 26, consumers can register with either Home Wireless Gold at RM74.20 (25GB + 40 GB Walla), Home Wireless Gold Plus at RM106 (50GB + 100GB Walla) or Home Wireless Platinum at RM159 (150GB + 1TB Walla), and plug, play and enjoy streaming videos and music all day. Prices are inclusive of 6% GST. Consumers can binge stream movies with up to 1TB of Video Walla, listen to the latest music hits via Music Walla or browse the internet, in the comfort of their home. 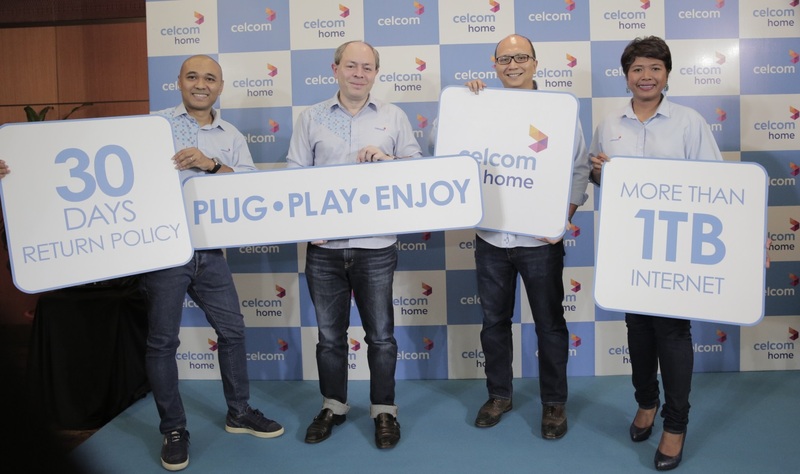 Celcom Home Wireless plans come with a Huawei B618 Modem priced at RM0 (RRP RM1, 500) and consumers can sign up with Celcom Home Wireless for 24 months without any additional cost and enjoy internet connection for up to 64 devices. Celcom Home Wireless will also be available during the Homedec exhibition at KLCC Convention Centre from April 26 to 29, 2018. Celcom is offering Homedec visitors an opportunity to win a one-year-free subscription of Celcom Home Wireless Gold and Platinum plans. Existing Celcom FIRST Gold Plus, Gold Supreme, Platinum and Platinum Plus consumers will also enjoy a RM15 rebate when they register for Celcom Home Wireless Platinum during the Homedec exhibition. Azwan Khan Osman Khan, deputy chief executive officer, Business Operations of Celcom Axiata Bhd said as Celcom continues its focus on meeting consumer needs with an awesome experience, its new Celcom Home Wireless plans offer an affordable simple plug-and-play broadband solution with plenty of data. “Within this digital era, many Malaysian homes have yet to have access to fast home internet and as this is our biggest data inclusion ever offered on our 4G network, it offers all Malaysians with the best value for fast home internet. “Consumers can digitally enjoy more of what they love doing right at their own homes, without the fear of running out of data. Nothing beats having an internet plan that gives you so much data, including a 30-day return policy, for nonstop entertainment at home,” he said. New and existing Celcom consumers may register for Celcom Home Wireless by visiting the nearest Celcom bluecube or Celcom Certified Partners nationwide.